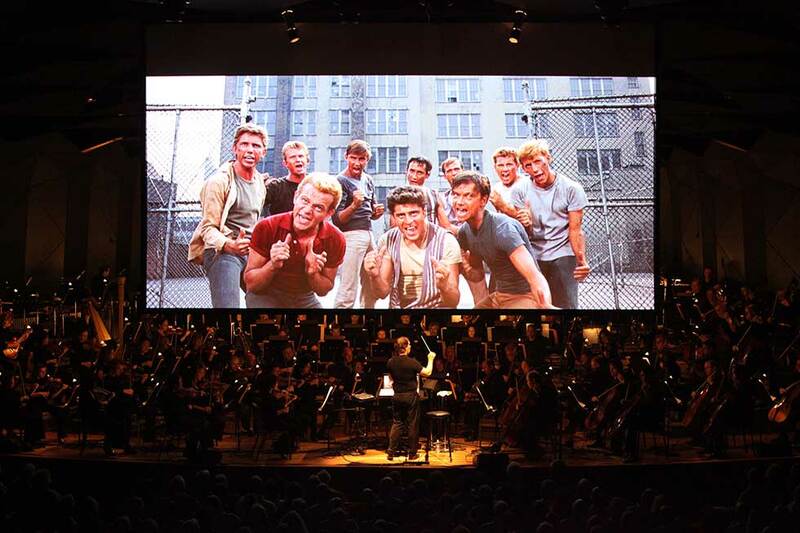 Last night the Boston Symphony Orchestra, conducted by David Newman, played Bernstein’s film score to West Side Story (1961) while the film unreeled digitally on screens in and around the Koussevitzy Music Shed. This was a perfect summertime event for an outdoor venue, and I hope the start of a new Tanglewood tradition. This evening was a reprisal of a 2011 presentation conducted by David Newman at the Hollywood Bowl with the Los Angeles Philharmonic. While Bernstein’s 1955 conducting tour to Los Angeles led to his meeting with Arthur Laurents and so had a hand in the creation of West Side Story, this evening at Tanglewood held a host of other resonances with Leonard Bernstein’s life, as Newman noted in remarks after intermission. For the first time (I think, and have seen nothing to the contrary) Tanglewood has hosted a film screening with live orchestra, the choice of film was perfectly appropriate. The overall effect of the night reminded me of going to a drive-in movie, or perhaps something akin to The Metropolitan Opera HD telecasts: live applause at a film screening is not the norm anymore, nor is live music at one. I mean no value judgments by this; my point is to describe the “one-off” nature of attending such an event. The film West Side Story was remastered in 2011 for its fiftieth anniversary. As part of that restoration work, Chace Audio by Deluxe used a technology developed by Audionamix; this allowed the film’s monophonic soundtrack to be separated into discrete elements. Using such source-separation technology, the dialogue, sound effects, and vocals were left in the film while the orchestral elements were deleted. This process, described by Steven Smith in the program note, is more sophisticated than my working assumption going into this event; I assumed the orchestral track had been either removed or silenced from the original audio tracks, perhaps even the audio track on the original 65mm film print. The end result, however, is the same: all the other sounds were left attached to the film, so now an orchestra could play the score live. Further complicating matters is the contentious orchestration for the film. Bernstein said he found the overly large orchestration (prepared by Sid Ramin and Irwin Kostal, and tripling the forces of the original Broadway pit orchestra) to be overbearing, lacking in texture and subtlety. Through the auspices of The Leonard Bernstein Office—intensive research by Eleonor M. Sandresky, and restoration, orchestration, and adaption work by Garth Edwin Sunderland—we now have a prepared, and printed, musical score to be played live accompanying the film. This restoration limits the orchestral forces, includes the entire end credit music, and addresses some of Bernstein’s dissatisfactions with the film’s original score. To pull off such an evening is a large technical feat. First there is the work to remove the orchestral track, and prepare a score to play. Then there is the need for Newman and the Boston Symphony to match entrances and tempi perfectly with the film while performing the Bernstein-Sunderland score some degree of freedom. Once or twice perhaps entrances weren’t as clean as they could have been. There are moments in the score where one could think the orchestra were a measure or two off from the film, but I think the conductor and orchestra remained true to the film’s pacing and kept the live music in sync with the recorded images and sounds (including the singers’ voices: most famously Mari Nixon for Natalie Wood as Maria, Jimmy Bryant for Richard Beymer as Tony, George Chakiris as Bernardo and Rita Moreno as Anita). We expect an easier score to accompany a film, but that is not what Bernstein wrote: West Side Story, like Sondheim’s A Little Night Music, comes closer to being an opera than a musical, and this holds true for the filmed version as well. The other technical issue is one of adjusting volume levels; here the shift from live to recorded sound was noticeable. The orchestra did an admirable job shifting dynamics when playing along with a singers, but the differences in volume level could have been worked out to be less obvious. The final difference is in quality of sound: on the lawn, at least, this was less lush, less “Surround Sound” than many of us remember. Is it fair to criticize the performance for making the changes Bernstein could not force the studio to realize? I think not. At the same time, watching West Side Story now is a salutary reminder of the stylization of musical theatre and film in the several decades preceding out current fetishizing of realistic special effects, body doubles, and CGI. Jerome Robbins’ choreographed fight sequence between the Jets and the Sharks is closer to ballet than a Hollywood filmic fight we would see on screen today. Visually West Side Story reads like a Broadway show captured on film stock, with a greater sense of theatre sets and blocking. Yet the action remains captivating, the characters engaging. The whole experience was at once familiar yet excitingly new. What we gained from this event was a greater emphasis on the music. Bernstein’s score is rhythmically complex (Jamie Bernstein links that to her father hearing Cuban radio broadcasts while in the Florida Keys) as well as captivatingly melodic. Of course, the film re-orders the songs from the Broadway show, and modifies some lyrics because of film censors; still the music is engaging and there is a pleasing continuity between musical numbers and orchestral interludes even in the film guise of West Side Story. Hearing the music played live brought this complex soundscape to life and to prominence. The playing was delivered with vigor and grace as the BSO provided their half of the evening’s billing. The rhythms danced and swayed; the melodies soared. The BSO brought Bernstein’s music to glorious life. The only insurmountable obstacle to the whole evening was the small size of the outdoor film screens. Large screens were mounted inside the Shed for those with the right tickets; the sizable crowd on the lawn, though, had to watch on small, washed-out screens mounted high on the outside of the Shed. Tanglewood really needs to invest in bigger and better screens before hosting another such evening—and dim the lighting lining the walkways near the Shed, to increase contrast and image quality for the lawn patrons.